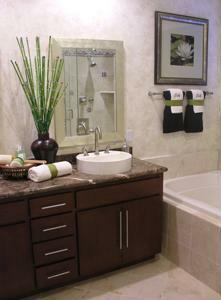 Bathroom Vanities and Accessories Design and Tips | DecorPlanet.com Blog: Have an empty nest? It's time to revamp your child's bathroom! Have an empty nest? It's time to revamp your child's bathroom! Now that your child is off to college and your home has become a lot more quiet, maybe now is the ideal time to take a good hard look at his bathroom to make some quick adjustments to its decorative scheme. If you're on a tight budget, there are some bathroom accessories that can give the space a quick face lift. Since bathrooms are so small, they are one of the easiest rooms to decorate in your home. Start by ditching your tired old shower curtain and replace it with a fabric variety flanked by a plastic divider. This will instantly infuse the space with a pop of color and give it a refreshed quality. If there's one major purchase you should consider to renew the look of your washroom, it's a bathroom vanity. This will give you a fabulous foundation to decorate the rest of the space, and you can give the room a modern touch with a vessel sink, elegant faucets and matching towel racks to improve the room's utility. Being in an empty house may seem like a downer, but with the kids gone, you can finally craft the personalized interior design you've always wanted. Now that the kids have moved out, how will your bathroom look?